Maryland Penitentiary from J.H.B. Latrobe’s Picture of Baltimore (1832). Johns Hopkins University Sheridan Libraries, F 189.B1 P53 1842 QUARTO. 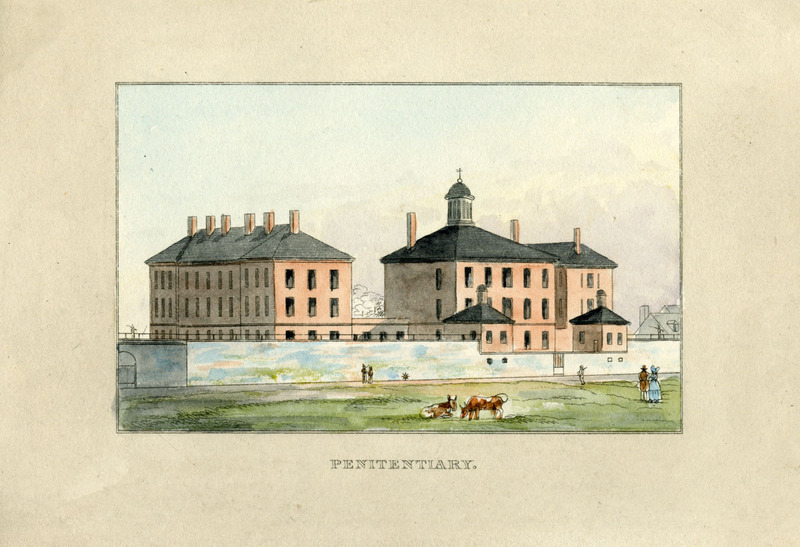 On February 23, 1814, Nathaniel Hynson, warden of the Maryland Penitentiary since April 1812 and a prominent cabinet-maker, was replaced by a new warden Benjamin Williams. Williams’ appointment sparked a conflict between the Inspectors of the Penitentiary (a group that included Hezekiah Clagget, John Hillen, James Kemp, George Lindenberger, Isaac McPherson, John Oliver, Henry Payson, George Roberts, Baltzer Schaeffer, Samuel Sterett, and Elisha Tyson) and Maryland Governor Levin Winder documented in a series of letters between the parties. On January 27, 1814, Benjamin Williams wrote “with concern” to Col. John Thomas in Annapolis sharing that the Inspectors of the Penitentiary objected to his appointment and remarking “should the intrigue of the Inspectors succeed, it would be a ruinous stroke to me.” On January 28, 1814, Baltimore judge Luther Martin wrote directly to Governor Winder, to note Williams’ arrival in Baltimore and object that none of the Inspectors had any prior notice and remarking that Hynson’s character and livelihood was affected by his removal. As a member of the Columbian Fire Company and a former member of the Baltimore First Branch City Council, Hynson was a well-known local citizen but likely still struggled from the sudden loss of wages from his position. Hynson may have returned to his trade as a cabinet-maker but, on March 14, 1821, he came back to the Maryland Penitentiary where he took over from Benjamin Williams as keeper until February 9, 1825. Sources: Scharf, John Thomas. The Chronicles of Baltimore. Turnbull Bros., 1874. pp. 187, 203, 205, 251; Radoff, Morris Leon. The County Courthouses and Records of Maryland. Hall of Records Commission, 1955, p. 249.